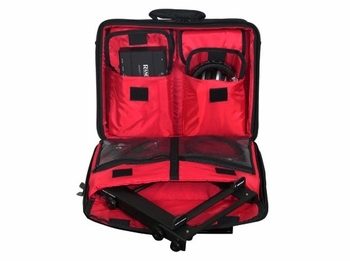 Odyssey BRLTECH Redling Series "Tech" Shoulder Bag DJParts - All Variety of Parts that DJ Needs. Odyssey presents the Redline Series, cutting edge bags for today's on the go DJ / Remixer / Producer. Each design not only makes you look good, they make you feel good. 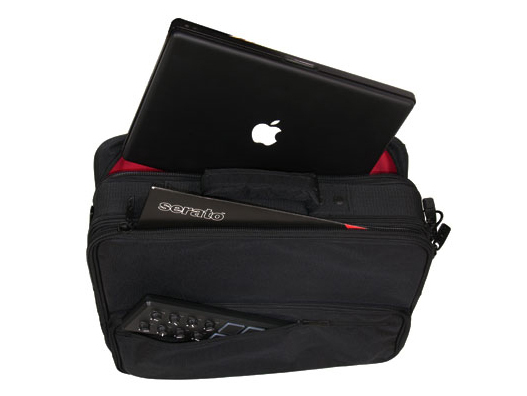 The Redline Tech bag lets you take all your digital essentials from one gig to the next. It has enough compartments and pockets to store an Odyssey LSTANDM laptop stand as well as your laptop, microphones, interfaces, cables, hard drives, headphones, vinyl, and much more. Fully padded in all the right places with a reinforced frame for the ultimate in digital gear protection. Fits gear such as: • Up to 17" Big Laptop • Cables • Turntable Needle Cartridge Case • Hard Drives • iPad • Serato Scratch, Traktor Scratch, and M-Audio Torq Interfaces • Laptop Stand (LSTANDM) • Vinyl, CDs, & Memory Sticks and much more!